Today we have added sensorineural hearing loss to our Diseases and Conditions section. 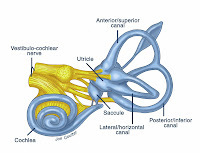 Nerve-related deafness is a sudden or rapidly progressive loss of hearing related to problems with the inner ear and the nerves that connect the ear to the brain. Researchers have confirmed a strong association with circulatory problems or lack of oxygen in the inner ear. As many as 20 per 100,000 people per year experience sensorineural hearing loss. Nearly all cases (9 in 10) involve only one ear. How wonderful that hyperbaric oxygen may now be used to save people’s sight (central retinal artery occlusion) and hearing. But in both instances please note the need for speedy referral to a qualified HBOT practitioner. For sudden hearing loss, according to UHMS, "The best evidence supports the use of HBO2 within two weeks of symptom onset." Also note the clinical evidence does not support the use of hyperbaric oxygen for chronic hearing loss or tinnitus. We urge interested readers to follow our links to the UHMS page on idiopathic sudden sensorineural hearing loss (ISSHL) and the Cochrane Reviews article on ISSHL and tinnitus. Carson McCullers's classic The Heart Is a Lonely Hunter is for extra credit only.